Sen. Norman Stone, left, at Senate rostrum with Senate President Mike Miller. When Dundalk’s Norman Stone was first elected to the legislature 50 years ago, John F. Kennedy was president, Spiro Agnew was about to become Baltimore County executive, Mike Miller was a student at College Park, Dutch Ruppersberger was a lifeguard in Ocean City and Barack Obama was a 1-year-old in diapers. 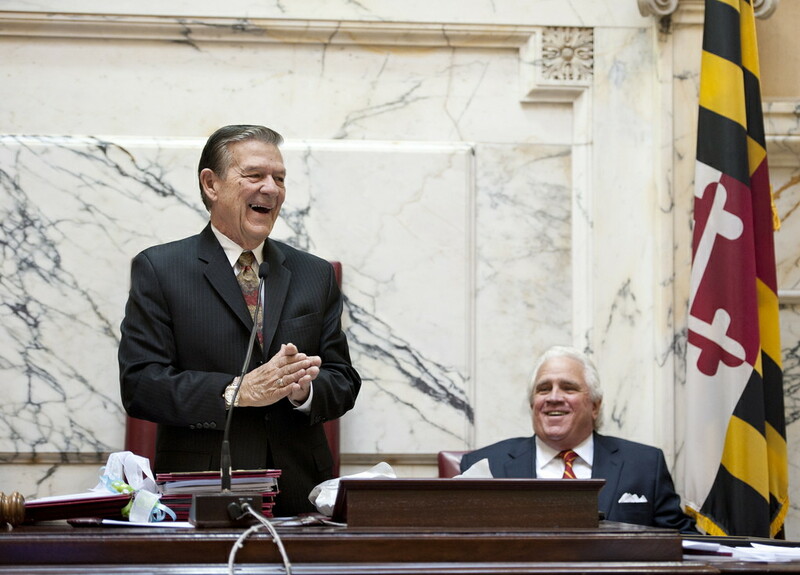 Now, a half-century later, Stone is the longest serving member in the current Maryland General Assembly and the longest serving state senator in Maryland history. He is an historical artifact in other ways: one of the last remaining fiscally and socially conservative Democrats – an opponent of tax hikes, abortion and gay marriage, a supporter of labor unions and the rights of workers and crime victims. Tuesday night he was honored with a dinner in Annapolis by some of his oldest and dearest friends, many of them former and current senators and delegates. “If I had made up the list, these are the people I would have invited,” Stone told about 120 people at the dinner organized by lobbyist Bruce Bereano. .
Stone entered the Senate in 1967 right after court-ordered reapportionment had added senators in suburban counties all over the state. He was sworn in with a number of young men who would go on to bigger things. Mickey Steinberg, a fellow Baltimore Countian and another 1966 classmate who became Senate president and then lieutenant governor with Gov. William Donald Schaefer, said Stone is evidence that “nice guys can win.” Steinberg got to know Stone as his seatmate and, in the 1980s, he appointed Stone to perhaps his two most powerful posts, as chair of the Constitutional and Public Law Committee, which no longer exists, and then the Economic and Environmental Affairs Committee, which got a new name. 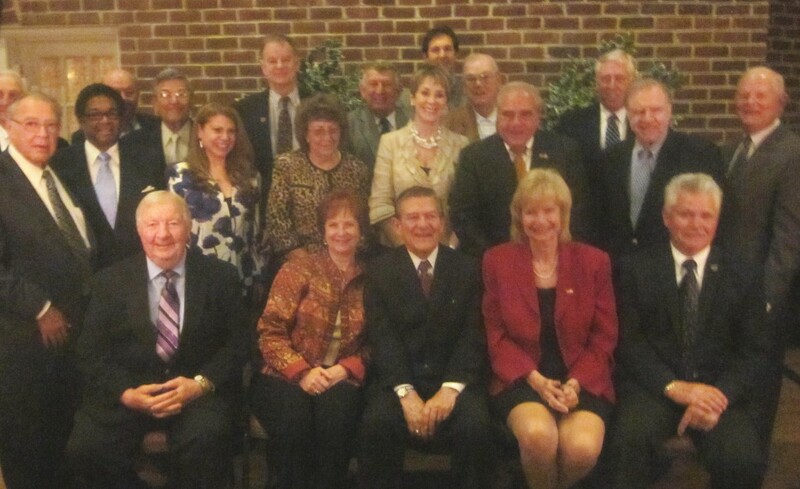 Sen. Norman Stone, seated at center, with current and former legislators Tuesday night. Stone, a lawyer, won passage of laws to register and punish sexual predators and numerous bills to protect dogs and other animals from abuse and punish those who abuse them. “People don’t understand what he’s done,” said current Senate President Mike Miller. For nine years now, he’s been Senate chair of the Joint Committee on Legislative Ethics because “he’s so morally straight,” Miller said. Master of Ceremonies Ted Venetoulis, the former Baltimore County executive, said Stone “does not say a lot,” a trait well-known to reporters. In keeping with that, Stone’s remarks were brief and modest. “I had so many things I wanted to say,” but didn’t. After 50 years, “Thank God I can still remember,” Stone said, recalling some his mentors in the legislature, people such Baltimore County boss Roy Staten and Speaker Thomas Hunter Lowe. “This has been an incredible ride for me,” he said. Is this the end of the ride for Stone? The talk among Dundalk residents was that he likely would not run again in 2014, when he would be 79 – but he’s said that before, one pointed out. Stone had his most serious challenges in decades in 2010, getting just 54% of the vote in the Democratic primary and 58% in the general. In the six past elections over a quarter century, Stone had run unopposed in several and gotten 70% to 80% of the vote in others. He had no opponents at all in 2002, the year he fought Gov. Parris Glendening’s redistricting plan that carved up his Dundalk district and won in court with the aid of attorney M. Albert Figinski, who was on hand to fete Stone Tuesday night. This year, Stone caught flack for his vote against gay marriage, coming 45 years after he was one of only seven senators to vote against the repeal of the Maryland law banning interracial marriage. This has led to a campaign against Stone by LGBT groups (that’s lesbian-gay-bisexual-transgender for those of Stone’s era), which called him a bigot. When he first heard of it in February, Stone was surprised. He cited his vote for Maryland’s public accommodations law in the ‘60s, one of the key civil rights measures of the day and a controversial one at the time. Stone said he has yet to make a decision about the next election.